The messengers Mark L. Prophet and Elizabeth Clare Prophet were embodied as Ikhnaton (Amenhotep IV) and Nefertiti, who ruled Egypt in the fourteenth century B.C. Pharaoh Ikhnaton introduced a revolutionary religion into Egypt based on the worship of the one God, and he is remembered for having founded the first form of modern monotheism. 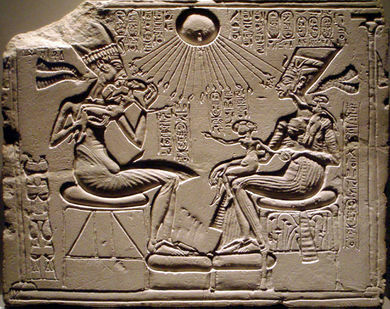 Thirty-three centuries ago, Ikhnaton (or Akhenaten, as the name is sometimes spelled) recognized the one God in the spiritual Sun behind the physical sun, and he called this God “Aton.” Ikhnaton visualized the Infinite One, Aton, as a divine being “clearly distinguished from the physical sun” yet manifest in the sunlight. Ikhnaton gave reverence to the “heat which is in the Sun,” as he saw it to be the vital heat that accompanied all Life. Ikhnaton created a symbol that depicted Aton as a golden circular disk from which diverging beams radiated. He was careful to point out that the solar disk itself was not God but only a symbol of God. Each diverging beam, or ray, ended in a hand extending over every person as a blessing, and in some depictions the hand brought the ankh, the symbol of Life, directly to Ikhnaton and his Queen. Impatient with the practices of priests of Amon at Thebes, the king not only denounced their gods and ceremonies as a vulgar idolatry, but built a new capital for the kingdom, Akhetaten (known to archaeologists as Tel el Amarna), located nearly three hundred miles north of the ancient city of Thebes. Ikhnaton prohibited the worship of the old Nephilim gods, particularly Amon, the chief god, and ordered their names and images erased from the monuments. These were both embodied and disembodied fallen angels, to whom the black priests had erected their altars. In his total loyalty to the one God of the Sun, Amenhotep IV changed his theophoric name to Ikhnaton, “He who is beneficial to Aton.” His passionate songs to Aton have been preserved as the fairest remnant of Egyptian literature. O Living Aton, Beginning of life. Thou didst create the earth according to thy heart. Seven hundred years before Isaiah, Ikhnaton proclaimed the vitalistic conception of the Deity, found in the trees and flowers and all forms of Life—with the sun as the emblem of the ultimate power he now proclaims as the I AM Presence. Although the consciousness of the people was not ready for the one God in Ikhnaton’s day, the impact of monotheism is felt to the present day throughout the world’s great religions. Unfortunately, the reign of Ikhnaton and Nefertiti was but a tender interlude in Egypt’s era of power. An idealistic reformer, Ikhnaton was not wont to send Egyptians to war in defense of dependencies of Egypt that had been invaded. As a result, the Egyptian empire shrank, and the ruler found himself without funds or friends. In the seventeenth year of Ikhnaton’s reign, he, his wife and the eldest daughter disappeared. Scholars have guessed that they were murdered. By whom and when and how is unknown. El Morya has shown us that it was the chief military leader, General Horemheb, who led a revolt against Ikhnaton and Nefertiti, and stabbed them to death. The black priests reestablished the former gods and obliterated the name and image of Aton and Ikhnaton. Ikhnaton died at the age of thirty, having failed to accomplish his dreams, and his successor, Tutankhamen, reinstated the old gods and feast days and returned the capital to Thebes. Some have theorized that the monotheism of the Hebrews was founded upon the Egyptian pharaoh Ikhnaton’s worship of the one sun god. In about A.D. 80 the Jewish historian Josephus quoted Manetho, an Egyptian historian, as stating that Moses was a priest of the Egyptian city of Heliopolis who became the leader of a group of heretics (i.e., the Hebrews). Since Heliopolis was the center of the solar cult of Re, out of which Atenism developed, the wisdom Moses would have learned there could well have been the monotheistic solar worship that theologians of Heliopolis had pondered since the days of the Old Kingdom. Others argue that the dates of Moses and Ikhnaton are not at all certain and that the Exodus of the Hebrews may have occurred a century before Ikhnaton. In 1939 Sigmund Freud published Moses and Monotheism, in which he claimed that Moses was a native Egyptian and disciple of Ikhnaton who taught the religion of Aton to the Israelites. The devotion to Truth demonstrated by these rulers is typical of the qualities required for true messengers of God. Ikhnaton’s virtue was not in military victory or in political bargaining with the priests of Amon, but in his total lack of compromise with error. His devotion to his queen was often publicly displayed and depicted in Egyptian art. The akashic records show that Ikhnaton had a great sense of mission to outpicture the principles of the Brotherhood, not only in his private life, but also in the laws of Egypt. The culture that the king and queen brought forth at Tel el Amarna in art, in poetry and in music was under the direction of the Brotherhood, inspired from Venus and the ancient lands of Mu and Atlantis when these civilizations were at their height. 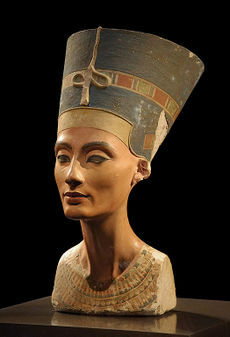 The bust of Nefertiti that can be seen today in a museum in Berlin is considered to be one of the masterpieces of the Amarna age. When one compares the portraits of Ikhnaton and Nefertiti with present-day photographs of the messengers, he will see how the characteristics of the soul are outpictured again and again in the physical form; indeed the physical form is the counterpart of the etheric. The resemblance may carry over for many embodiments until the traits change. Elizabeth Clare Prophet, Ikhnaton: Messenger of Aton (DVD). Mark L. Prophet and Elizabeth Clare Prophet, The Path to Immortality. Pearls of Wisdom, vol. 32, no. 65. ↑ James Henry Breasted, A History of Egypt: From the Earliest Times to the Persian Conquest (New York: Charles Scribner’s Sons, 1912), pp. 360, 361. ↑ Cyril Aldred, Akhenaten: Pharaoh of Egypt (London: Thames and Hudson, Abacus, 1972), p. 133. ↑ Will Durant, The Story of Civilization (New York: Simon & Schuster, 1954) I:206, 208. Durant comments on this poem: “The obvious similarity of this hymn to Psalm CIV leaves little doubt of Egyptian influence upon the Hebrew poet” (p. 210). ↑ Robert Silverberg, Akhnaten: The Rebel Pharaoh (Philadelphia: Chilton Books, 1964 ), pp. 191–92. This page was last modified on 7 November 2016, at 16:59.